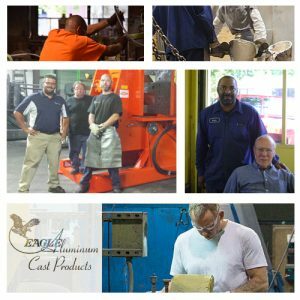 Muskegon, MI: Jobs at Eagle Aluminum | Eagle Aluminum Cast Products, Inc.
Eagle Aluminum Cast Products, Inc. has several openings for jobs in Muskegon, Michigan. If you’re looking for Muskegon, MI jobs, now is your chance to join a growing company with a solid financial base. Not only are we a world-class aluminum casting foundry, we are also a tight-knit company with a family-like atmosphere. Eagle Aluminum can provide you with steady work, inclusive company culture, great benefits and ample opportunities for growth. To apply for a job at Eagle Aluminum, contact Workbox Staffing and let them know you’re interested in working at Eagle Aluminum Cast Products. Permanent molding & tool making facility at 2134 Northwoods Dr.
*Note that these benefits are only available upon successful completion of a probationary period. Curious about what we do at Eagle Aluminum? Read more on our Services page.